Free to Play London Olympic Archery, start your free game now (2016). 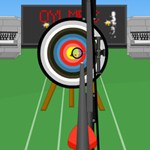 Description: Show up your bow skills in this exciting archery game. You must have a high score towards the end of the game, and you must take into consideration the wind. Aim and perfectly time the center of the target to get the perfect points. Fire your arrows as accurate as possible at the targets. Keep from missing or poor shots. Good luck and have fun!